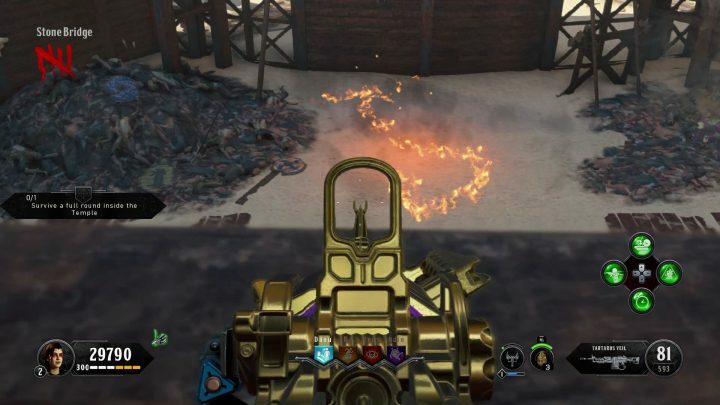 Zap zombies with a deadly scorpion that stops even the toughest undead in its tracks — here’s how to get the Death of Orion Wonder Weapon in the map “IX” for Call of Duty: Black Ops 4. This is one of the most complicated Wonder Weapons to acquire that I’ve seen so far, so I’m going to explain every step you need to know to actually get this thing. Best of all, it can be upgraded with the Pack-a-Punch. 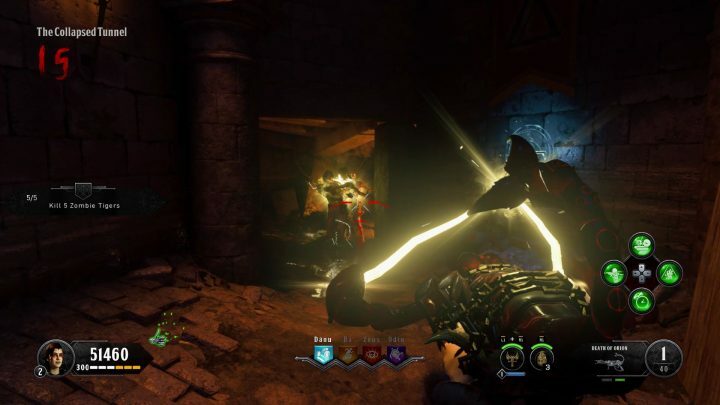 The Death of Orion is a scorpion strapped to your wrist that shoots lightning bolts — if you charge the bolts, the targeted zombie will be stun-locked, and any zombies that get close will also get zapped. You can control crowds of zombies, even boss zombies with this incredibly useful little weapon. Before we begin hunting down the Death of Orion, you’ll need to unlock the Pack-a-Punch machine. It’s really simple, just ring all four gongs, defeat the four champions in all four God Towers, and place the heads on the spikes in the Temple. If you’ve done that, we can begin. To prepare for future steps, you’ll want to build the Acid Trap. 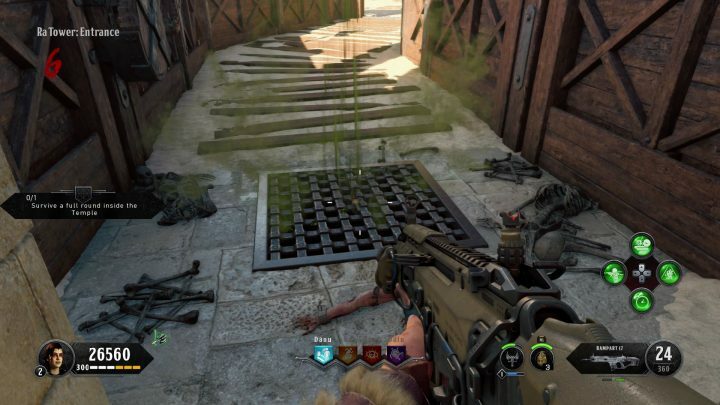 There are three parts you need to acquire — once the Acid Trap is constructed (there’s one near the Entrance of all four God Towers) it will be unlocked for every Acid Trap location on the map. To construct an Acid Trap, acquire all three parts, then interact with a skull switch built into the wall. The parts are always found in the exact same place. Part #1: Chains – Found in the underground Temple. Look under the balcony. In a corner, the chains are hanging from a metal hanger on the wall. Part #2: Gear – Also in the temple, the big Gear is in a corner under the steps / balconies. Look on the first floor to find it. It’s big, so it’s easier to see. Part #3: Pot – The metal pot is the hardest part to collect. You need to complete three challenges. After three challenges are complete, a pot will appear on the center pedestal. How Challenges Work: To begin accepting challenges, look for the rolled-up hanging banners in the spawn room. Melee attack the rope holding one of the banners up, and challenges will begin to appear. Complete three of them — for each challenge you complete, you’ll get a reward on the podium in the center of the spawn arena. Getting the Scorpion Key requires multiple steps. To get started here, you need to have the Pack-a-Punch unlocked. Once that’s done, you can begin. Go to the Danu-Ra Temple Entrance room in the underground. There’s a passage blocked by a law metal fence with a fire brazier down the hall. Shoot the brazier, and it will fall over. Go up to the bridge connecting the Danu Tower and the Ra Tower. Look at the ground facing the arena, and you’ll find a burning pointer. The fire appears to be a pointer. The pointer is aiming at the tower where the statue head has spawned. The pointer aims at one of the four towers. On all towers, the statue head will spawn in the room below the entrance. Usually, it will appear near the center detail. Ra Tower: Behind one of the corner fire braziers. Danu Tower: In the water in the center. Odin Tower: Under the massive cauldron. Zeus Tower: In one of the corners of the blood bath. Collect the Statue Head. Now that you have the head, you can melt it down and collect the Scorpion Key inside. The Scorpion Key is acquired from the Statue Head. Before continuing, use the Acid Trap parts on any Acid Trap on the map to construct the trap. Place the Statue Head on any Acid Trap grating after constructing the trap. Do not activate it yet! Once the Statue Head is placed on the grating, activate the Acid Trap to melt the head. The head will melt, and leave the Scorpion Key behind. There’s one more component you’ll need — the Gold Vase. To get the Gold Vase, you’ll need to get it as a unique reward for gaining Crowd Affinity twice in a row. 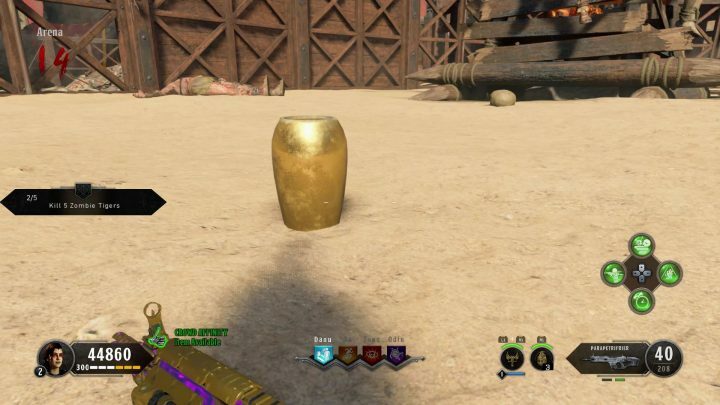 After getting Crowd Affinity twice, a special message will signal that the Gold Vase has dropped somewhere in the spawn arena. Look at the bottom-left of your HUD. The symbol represents Crowd Affinity — the better you do, the more the crowd will cheer. When green sparks fly from the symbol, you’ll have Crowd Affinity. To get Crowd Affinity easily, complete challenges then melee the rewards on the Challenge Podium to ignore them. If you don’t pick-up the rewards, the crowds seem to like you better. When you hear the special message, look around the ground in the spawn arena to collect the gold vase. Now we’re ready to get the Death of Orion. Go to the Arboretum, the lower floor of the Tower of Danu. Look on the second tree from the stairs to the Entrance — there’s a tiny hole on one of the tree surfaces. Melee the hole to insert the Scorpion Key. After inserting the Scorpion Key, hold [Interact] to place the Gold Vase below to collect the acid. Wait a turn. After one turn passes, pick up the Gold Vase. Go to the Mystery Box and use the acid on it. A special prompt will appear — when the Mystery Box turns green, use it and the next weapon that appears will always be the Death of Orion. The Death of Orion is an incredibly useful weapon, and you can Pack-a-Punch it to create Serket’s Kiss, an even-more-powerful version of the weapon.